Features: Royal Gorge Cross Country Ski Resort, the largest of its kind in North America, offers more than 60 carefully groomed trails that will allow Nordic skiers of all levels to get lost in the beauty of Lake Tahoe. Located only 1.5 hours from Sacramento, Royal Gorge Ski Resort Tahoe is the closest resort to the Bay Area. Why We Go: When your body needs a rest from the frequent falls involved with downhill skiing, there is no better way to still enjoy the scenery and yet take it easy than cross country skiing. Charming Lodges: Rainbow Lodge provides a convenient, quaint little place where you can continue to enjoy the beauty of Tahoe. Meanwhile, Ice Lakes Lodge is situated with ski-in, ski-out access, allowing visitors to never even leave their skis. Variety: With 60 trails and a seemingly endless skiable terrain area, you will never get bored at Royal XC Ski Resort Tahoe. Inside Knowledge: Make sure to stop by the various warming huts available out on the trail when it gets too chilly. A quick stay by the fireplace will warm you right up. Do Be Ready for Some Downhill Action: Just because the trails are traditionally Nordic at Royal Gorge XC Ski Resort Tahoe doesn't mean there aren't harder runs featuring slight downhill portions. Be ready to fall occasionally unless you have cross country truly mastered. Do Bring Your Dog: In a recent development, Royal Gorge now allows dogs on certain trails on Mondays, Tuesdays and Thursdays. Have a blast with your canine; just make sure to pick up after them. Don't Skijor: Skijoring, the sport of being led by your dog or horse while on skis, is unfortunately not allowed at Royal Gorge XC Ski Resort Tahoe. Don't Miss the Mini Clinics: Sometimes, all you need is a quick brush up lesson to shake off the rust. Luckily, Royal Gorge XC Ski Resort Tahoe offers occasional FREE mini clinics hosted by the Royal Gorge instructors. Royal Gorge closes when there is not enough snowfall to maintain the trails. Make sure to check weather reports beforehand. Royal Gorge Cross Country Ski Resort is a full-service cross country resort, featuring rentals, lessons, kid's camp and cafe. Royal Gorge Ski Resort Tahoe now allows dogs on select trails, except during holiday periods. Royal Gorge Cross Country Ski Resort is the largest cross country ski resort in North America. 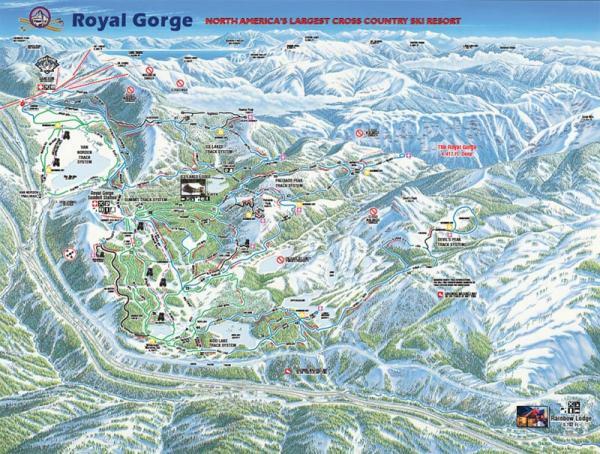 Only 1.5 hours away from Sacramento, Royal Gorge XC Ski Resort Tahoe is the closest resort to the Bay Area. Group lessons are available for $25 at 10:30am and 12:30pm each day, while private lessons are $48 and $20 for additional persons (by reservation only) for one-hour of personalized guidance. The Super Package includes rental, trail pass, and a 1.5 hour group lesson for $59 for adults and $40 for kids aged 6-17. Kid's Camp for ages 6-12 is $40 and available either in a morning 10am- 12pm session or an afternoon 1pm- 3pm session. Full day 10am- 3pm sessions are $70, and includes lunch. Thanksgiving - Mid-April, depending on snowfall. On-site ski rentals, dining and accommodations at Royal Gorge's Rainbow Lodge and Ice Lakes Lodge, a ski-in ski-out lodge. A package including cross country skis, snowshoes, boots and poles are available for $23 for adults and $15 for youth. An afternoon rate (after 12:30pm) runs $17 for adults and $15 for youth. Multi-day plans run $20/day for adults, and $15/day for youth. A pulk sled for children is also available for $20/day.